I was recently asked to pick one of my favorite recipes to serve at a tailgate. 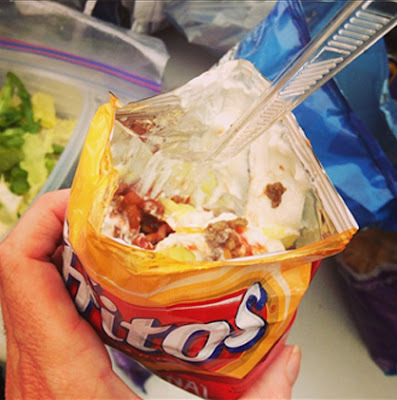 I know I've mentioned these "walking tacos" before but I don't think I ever posted my recipe. Can't believe the season starts next weekend. I am so excited. I think I will bring these to our first tailgate too! Happy Friday. Instructions: Brown beef or turkey and drain the fat. Add the onion to the meat and sautee a couple of minutes until soft. Add the taco seasoning along with 1/2 cup of water and simmer until water is absorbed. If serving immediate pour in a bowl. You can also combine the meat and black beans if you want. I keep it all warm in a crockpot at the tailgate. Crush your chips a bit with your hands and open your bag. 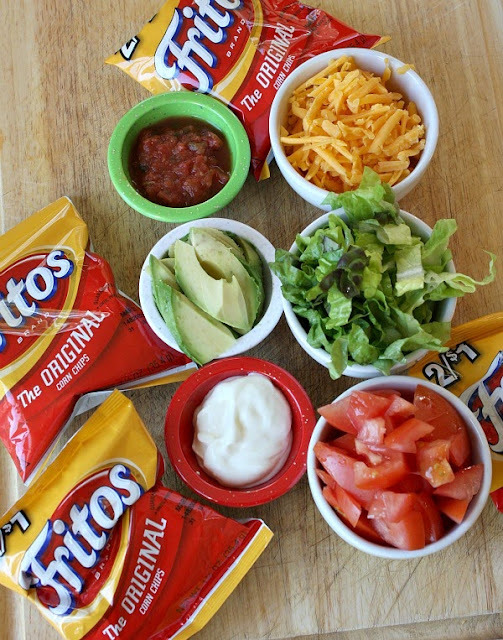 Add whatever toppings you like and eat with a fork as you visit with your friends. cant wait for OU football!!! Go sooners! They are so good and so easy! Check out these OU burgers from Sonic http://newsok.com/article/3874520.